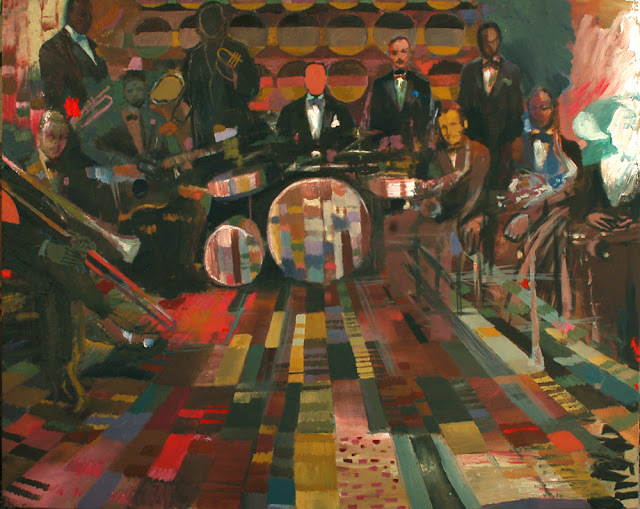 In researching a recent story on the forgotten king of jazz – Buddy Bolden – I stumbled upon the art of Noah Saterstrom. At the time it was my objective to have that one piece of art accompany the article. It was a work of art based on the only known photograph to exist of Buddy Bolden. That didn’t come to pass…this interview did. You briefly lived in NOLA in 2007. How did you find New Orleans? How has New Orleans stayed with you? Growing up in Natchez, Mississippi, trips to New Orleans with my family meant ‘going to the city’ and on those trips my young brain was imprinted with so much Southern-ness, or the specific South that is particular to that region. It’s such a common response, but New Orleans really is so vibrant and thick with life, even as it is pre-occupied with its own shadows. I had been away from the Deep South for a many years, so when I was there for about four months in 2007, I felt a rush of familiarity so strong and attractive that it sort of overwhelmed my senses. With that in mind, I’m not sure I have a very nuanced view of the city, not objective at any rate; New Orleans stays for me half in the real of my child version’s imagination. I suppose I did pick up more on the lawless, anarchist tendencies of New Orleans than I did when I was younger. Hard to say if that has increased after the storm, it’s always been loosely-affixed as a city. The mistrust of authority is attractive, and the anti-establishment feeling (especially in regards to the Arts) is deeply appealing to me. In particular, I enjoyed getting to know the 17 Poets reading series at the Gold Mine Saloon, run by Dave Brinks and Megan Burns on Dauphine Street in the French Quarter. Their way of creating a casual intellectual community that is regionally-identified without getting bogged down in regional-ism, is really special. Not sure how they do that. What was the impetus for the Buddy Bolden series of paintings? Were you already familiar with Buddy Bolden via Michael Ondaatje? I read Coming Through Slaughter years ago and loved it. The way Ondaatje embodies the character of Buddy Bolden, the voices and tone of the time and place the book is set is remarkable. The early 20th century New Orleans street life is strangely believable and coherent, even though he constructed the narrative from dangly fragments, and all the while being a Canadian of Sri-Lankan descent! Maybe what works for me about Coming Through Slaughter is that he is responding directly to the music, not trying to embody a culture which is not his own, faking an accent or anything, but responding to the music, using his own medium; a kind of cross-disciplinary translation. 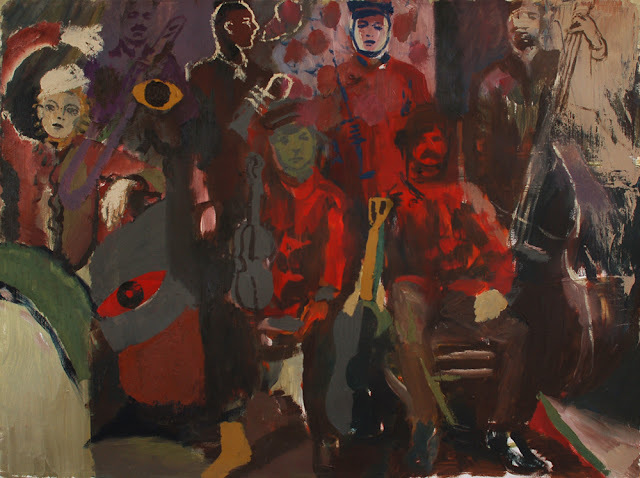 The cover image of that book is the (only) photo of Buddy Bolden’s band and I made a painting and a few drawings of it in 2005. 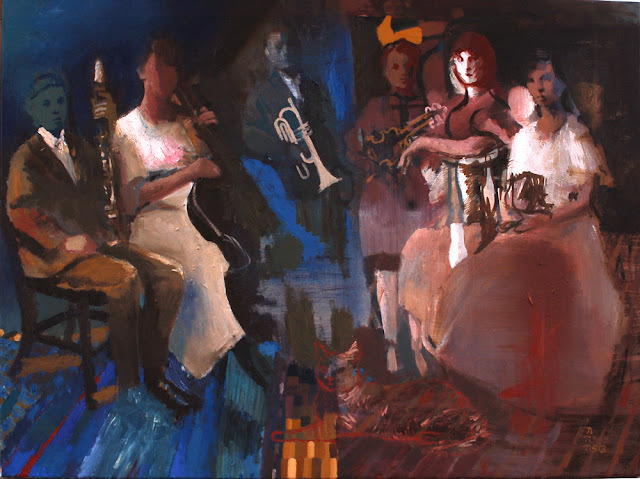 Since then I’ve made a dozen or so paintings based on that image and have expanded the theme to be more broadly: groups of musicians. You are working on a music-inspired exhibition at the Carol Robinson Gallery in New Orleans (opening April 2013), could you tell me a bit more about this upcoming show? Who are the musicians being represented in this work? Are you listening to their music as you create your art? Sure, the exhibition is called “Float Me Down the River” and it opens at the Carol Robinson Gallery (corner of Magazine and Napoleon) on April 6. All the paintings are based on photographs of groups of musicians from 1910’s to 1930’s. By ‘based on’ I mean the photographs are a kind of diving board. I’m more interested in painting than I am in photographs, or painting photographs faithfully, so I diverge a lot, making all sorts of visual contrivances, I do what I can to make a good painting. And when I get lost, I’ll use the photograph to ground the image again, but ultimately the painting has to stand up on its own accord. The musicians depicted include ragtime players, swing bands, chamber music groups, blues musicians. They are not portraits, they are more compositions, with some implied narrative built in. To paraphrase what Cezanne said about baskets of apples, I’m not interested in musicians, I’m interested in how we see. In fact, one of the greatest challenges of these groups for me is to try to avoid all these frontal figures from striking the viewer as portraits. I hope to avoid the question “who’s that?” Most of the canvases are landscape-, rather than portrait-format, so the eye is inclined to see them as compositions or figures, rather than portraits of people. It’s a delicate balance and each painting requires a different approach. I do listen to the music of the groups I’m painting while I’m painting them. Well, it’s not a precise thing, but one paints a very different kind of painting while listening to ragtime and all of its jumpy, goofiness, or Dixieland’s flamboyant trombone slides and controlled cacophony, than say Joy Division, or Tchaikovsky. I wanted a little of the humor of ragtime to come through these paintings. In checking out your other shows and other locales on your website it was cool to see your connections to poetry, Drunken Boat, Anne Waldman and Bisbee, AZ. What do these connections mean to your art and creative process? What influence does poetry have on your art? I would say that poets have more of an influence on me than poetry does, though words are important to my work. To make a sweeping statement, I get along really well with poets. We share a kind of artistic ethos, where exploration, and fleet-footedness and spontaneity are celebrated over product and mastery. I find myself collaborating with writers a lot, projects spring up effortlessly and a playful idea leads to sometimes very elaborate works, and talk of product doesn’t come into it until very late in the process. I also work with folks making sounds, videos, and images… it’s not necessarily poets or poetry that are inspiring to me, but a poetic impulse maybe, regardless of the medium. The questions that birth more questions are infinitely more interesting to me than answers and proficiency. What influence does music have on your art? It’s hard to say, music is always playing while I paint, so I’m sure my body movements are influenced by what is playing – and of course brush strokes are recording every subtle movement – though I’ve never studied that in detail. I used to play a lot more music, guitar and piano. As a young teenager I learned ragtime piano from a guy called Burnley, who wore overalls, had a Laurel and Hardy sense of humor and played piano at a catfish joint in Natchez. Then I taught myself country blues guitar. I love music, but find it difficult to override my own style and limitations; in paint I feel less constricted, when things are going well at least. Some of these musician paintings at the Carol Robinson Gallery feel more like the music that I love than anything I could play on the guitar or piano. Which might bring us back to what I loved about Ondaatje’s literary translation of early jazz. For me, the boundaries between words, sounds and images are porous and it’s best to use whatever medium feels most flexible and useful. What is the one thing that you would like people to know about you and your art? Right now? That these paintings are here! If you’re in NOLA, go see the Carol Robinson Gallery from April 6 – 30. (The Bar None Group thanks Noah for his time and enthusiasm in allowing us to explore his art. All images in this article are © Noah Saterstrom and are used with permission of the artist.